Though I have been out of the game for some time now, my first love of competitive gaming was Magic: The Gathering. So, just in time for the Innistrad pre-release this weekend, I am debuting the first part of a review of the set for Limited tournament play. Specifically, geared towards draft, but it should have relevance in sealed as well. Lets start with the basics. 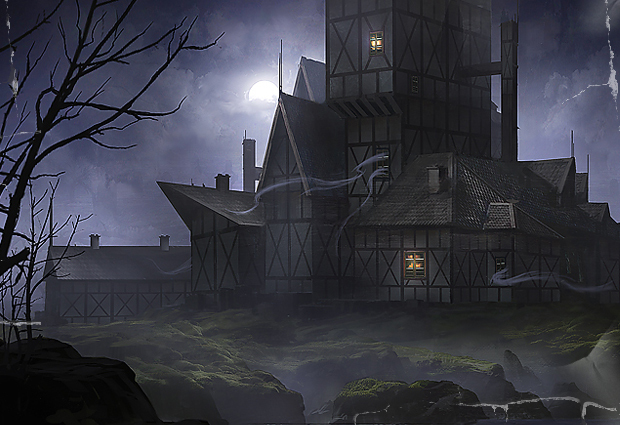 Innistrad draws on the theme of classic horror with a very gothic and dark feel. As the image above shows, its a pretty bleak world. This focus on classic horror gives the set a mild but significant tribal aspect. In addition to classic horror monsters like Ghosts, Vampires, Zombies and Werewolves; humans, in the form of priests/exorcists/slayers/villages occupy a major tribe. These races are distributed among the 5 colors with each color having 2 of them (though all colors have humans in them). Blue seems an odd place for zombies at first, until you realize the "zombies" in blue represent science run amok, bringing things back from the dead. Think abominations like Frankenstein's Monster. With that out of the way, lets begin by looking at the White cards in the set. Abbey Griffin - A typical vanilla griffin. You never can question the value of a reasonably priced flyer, especially when they can play both offense and defense. However, the lack of the spirit type, hurts it. Certainly not a top 5 pick, anybody playing white shouldn't overlook this in the middle of a pack. Angel of Flight Alabaster - Extremely potent card, among the best rares in the set for the right deck. The ability to recur creatures is extremely strong in limited, as is flying and 4 toughness. All 3 on the same creature, in addition to an easy mana cost for splashing make this a top pick. However, if your deck is lacking in spirits, you may need to take removal instead. So always a top 1-3 pick, typically a #1. Angelic Overseer - Despite being a mythic rare, in most cases I would prefer having the other Angel. That being said, this thing is certainly a bomb and can single handily win many games in the right deck. Always top pick for a deck that can use it. Avancyian Priest - Solid mid-late round pick, even better for a human themed deck. The 1 colorless to activate really hurts him. Still not bad in most decks, but don't reach for him as he will likely slow down progression early, where tappers are most potent. Bonds of Faith - One of my favorite cards in white. This cheap enchantment either works as a lock down pacify for a non-human or a buff for a human beater. Since most of the bombs in this set are non-human, this essentially is unconditional removal or 2 extra damage per turn, depending on situation. That versatility makes it my favorite white common. Champion of the Perish - As an uncommon, I would like this guy a lot. As a rare, he is pretty useless. Sure, if you happen to drop him first turn, he will scale amazingly in the right deck. But as a rare, that is pretty unlikely. Play him if you happen to get him for your human based WW deck, but he isn't a great card. Chapel Geist - Cornerstone of the Spirit based skies deck, this guy is efficiently priced for his stats and survives encounters with most other common flyers. His mana cost makes him a bit difficult (double white) but still a top 5 pick for a spirit deck. Cloistered Youth / Unholy Fiend - The first of the new "double" cards, this thing is a beast of an early beater. Unlike some other double cards, you cant transform her back, so make sure you wait on transforming till it is most advantageous to you. Dearly Departed - 5/5 flyers are always good. The additional effect from the yard is great, though its creature type and stats mean spirit based decks are likely to take it first as well, meaning you are pretty unlikely to get it. In addition, with the amount of enchantment based removal in the set, there is no guarantee it will end up in the yard. One good thing is that it does have a positive for you if it gets milled out, so all in all an excellent card for any deck that can use it. Divine Reckoning - This card, without the flashback, would be very, VERY good. With flashback, it is absolutely incredible. Top white rare and a strong de-draft candidate if you are planning on winning with more then one creature. Absolutely incredible. Doomed Traveler - Doomed to the back of the pack. I can't see anyone taking this earlier then 12th pick. Elder Cathar - Another filler creature, this one seems solid in a human tribal deck, and not terrible in any white deck. Look for these late pack to round out your creature base or for your 39th-40th card. Elite Inquisitor - Awesome card, especially for limited. Especially nice target for a boost to make him nearly invincible in combat. Feeling of Dread - Not a terrible card, but only when you can activate the flashback. By itself, it is a very low pick. Fiend Hunter - Solid removal card, with a creature to boot. Unfortunately, that is also part of its drawback. Don't get too brave with using him as a block, since one combat trick could essentially turn a 2 for 1. Gallows Warden - A nice card for a spirit deck, and is very splashable. 3/3 flyers are never bad, even for 5 mana. Definitely a top tier pick for spirit decks, and a strong mid pick to splash. Geist Honored Monk - Not a bad creature at all, since even by himself he is a 3/3 with his spirit pals. Given a few more creatures, he can be a very strong creature that controls the board. Ghostly Possession - The worst removal you could play. Certainly a weak card compared to other white options. Be wary of your chances to win if you are playing these. Intangible Virtue - Could be strong, depending on the rest of your deck, otherwise pretty weak. You need to know how many token creatures you can reasonably create to see if this is worth it. Also, the effect really isn't strong enough to build your deck around so I don't see this ever being a top pick, but don't ignore it if it comes around late. Mausoleum Guard - Better then doomed traveler, but still highly a filler card. Mid pick at best, depending on deck comp. Mentor of the Meek - This effect, on the other hand, is strong enough to build your deck around. The weak point of WW based strats is typically that they run out of gas. This guy can keep you going through the mid game and combos very well with mausoleum guard and doomed traveller; making them marginally better. Midnight Haunting - Overall strong card, made even better with Mentor of the Meek and Intangible Virtue above. 2 power of flying creature for 3 is never bad, especially at instant speed. Mikaeus, the Lunarch - Very powerful card, with the ability to dominate a game late, pushing past stalemates. Unfortunately, as a Mythic Rare and extremely splashable, unlikely to make it to you on the pass. Moment of Heroism - I like this card a lot. Nice combat trick and a big life boost for only two mana. I like this somewhere in picks 5-8, any lower then that and you lucked out. Remember though, they are worthless without creatures, so take your deck comp into consideration before whirlwind picking this ahead of even a vanilla creature. Nevermore - I like this card for constructed, but I could never see this being useful in limited, except maybe as a silver bullet sideboard card against huge bombs. Never maindeck this. Parsalene - Bad card, even as filler. Purify the Grave - Better card then it looks initially, since there are great graveyard effects and strong flashback cards all over this set. Not worth taking until late, or putting in before 38th card. But definitely a nice card to have as an option in the board. Rally the Peasants - Assuming you can flash this back, it is a great finisher card. Take it near the bottom of the pack, and try to find a way to flash it back. Rebuke - While conditional, typically you only worry about the creatures attacking you anyway, making this a very strong card. Top tier common, for sure. Selfless Cathar - Bad filler card. Might have been useful once upon a time when you could put combat damage on the stack, but now... not great. Silverchase Fox - I like this card quite a bit. Having enchantment removal in this set is never bad, and attached to an efficient creature. Only thing holding this guy back is his meaningless creature type. Slayer of the Wicked - Top tier card for limited. You should nearly always have a target for his ability which should leave you with a strong creature (3/2 for 4 isn't a bad deal). Best white uncommon imo. Smite the Monstrous - Quite a bit worse then Rebuke, it is still removal, so it shouldn't be overlooked. Spare from Evil - Strongest combat trick in the color and can turn the tide of the game. Definitely take this fairly high. Spectral Rider - Another strong evasive spirit. The color cost hurts, but it is still a solid man. Early-Mid Pick. Stony Silence - Pretty bad, even for a sideboard card. Sometimes you might need it vs a strong equipment based deck or something similar. Thraben Purebloods - Very vanilla filler card. Big backend though, and can fill a hole. Traben Sentry / Thraben Militia - Strong filler creature. Would have been better if the transformed version retained vigilence. Either way, very solid midpack card. Unruly Mob - Not horrible in a human based WW deck, but pretty poor overall. Urgent Exorcism - Great card, you should almost always have a target for this. However, since it is a utility card, don't pick it high, wait for it to come in late. I feel its main deck material. Village Bell Ringer - Another great combat trick. Solid stats to boot. Definitely a nice card for the deck, don't be afraid to take it fairly early. Voiceless Spirit - Vanilla, but strong in the spirit based U/W build. Don't be afraid to take it early if you don't have this slot filled in your drop order. Whew, well that was a meaty post. I think white, overall, seems very strong with several flyers and strong removal. Since I started this a bit late, I won't get the rest of the colors done before the pre-release this weekend, but hopefully within a few weeks we will lay it all out and get a better picture of the limited scene with Innistrad. Thanks for reading! oh hey, I was just coming here to post something similar, haha. Do it up bro!